Over the last two weeks I have been playing with kubernetes. I have extensive experience building microservices and below I will demonstrate how to build a microservice, contain it using docker and deploy on kubernetes. Spring boot allows a developer to build a production-grade stand-alone application, like a typical CRUD application exposing a RESTful API, with minimal configuration, reducing the learning curve required for using the Spring Framework drastically. Spring Boot favors convention over configuration and is designed to get you up and running as quickly as possible. 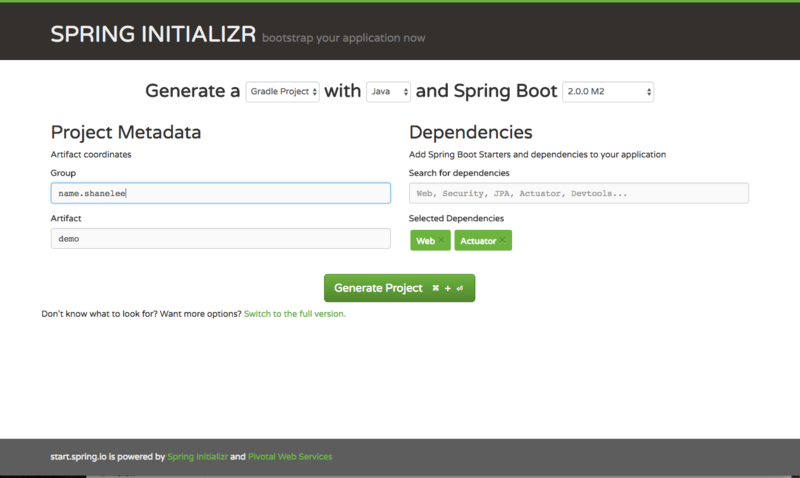 To create your spring boot app we will use Spring Initializr web page and generate a Gradle Project with the pre-selected Spring Boot Version. We define name.shanelee as Group (if applicable) and define the artifact name. From here you can choose whatever dependencies you need for your microservice. We use Web for supporting tomcat and restful API. Actuator dependency which implements some production-grade features useful for monitoring and managing our application like health-checks and HTTP requests traces. Spring Initializr has already created everything for us. We just need to have a Java JDK 1.8 or later installed on our machine and the JAVA_HOME environment variable set accordingly. The application is up and running and we did not write one line of code! Spring Boot is opinionated and auto-configures the application with sane default values and beans. It also scans the classpath for known dependencies and initializes them. In our case, we immediately enjoy all the production-grade services offered by Spring Actuator. NB: Actuator endpoints is important when we deploy the container in kubernetes. It needs to know when the microservice is ready to handle network traffic. Let's start by creating the Dockerfile in the root directory of our project. The VOLUME instruction creates a mount point with the specified name and marks it as holding externally mounted volumes from the native host or other containers. ENTRYPOINT defines the command to execute when the container is started. Since Spring Boot produces an executable JAR with embedded Tomcat, the command to execute is simply java -jar microservice.jar. The additional flag java.security.edg=file:/dev/./urandom is used to speed up the application start-up and avoid possible freezes. By default, Java uses /dev/random to seed its SecureRandom class which is known to block if its entropy pool is empty. This is what is recommended by 12factor principles. Microservice should not attempt to write to or manage logfiles. Instead, each running process writes its event stream, unbuffered, to stdout. During local development, the developer will view this stream in the foreground of their terminal to observe the app’s behavior. In staging or production deploys, each process’ stream will be captured by the execution environment and routed to one or more final destinations for viewing and long-term archival. As I will be using kubernetes, I will define a daemonset logging shipper called fluentd. Kubernetes logs the content of the stdout and stderr streams of a pod to a file. It creates one file for each container in a pod. The default location for these files is /var/log/containers . The filename contains the pod name, the namespace of the pod, the container name, and the container id. The file contains one JSON object per line of the two streams stdout and stderr. Fluentd is a flexible log data collector. It supports various inputs like log files or syslog and supports many outputs like elasticsearch or Hadoop. Fluentd converts each log line to an event. Those events can be processed and enriched in the fluentd pipeline. In a production environment you have to implement a log rotation of the stored log data. Since the above fluentd configuration generally will generate one index per day this is easy. Elasticsearch Curator is a tool made for exactly this job. Curator can run as a container similar to one I defined here also or a scheduled lambda function. Logs to stdout have to be in JSON format. I will discuss how to run kubernetes locally using minikube and how to define resource objects for the microservice above. In a later post I will talk about creating cluster on aws using kops. To run kubernetes locally you need minikube. Minikube runs a single-node Kubernetes cluster inside a VM on your laptop for users looking to try out Kubernetes or develop with it day-to-day. After cluster created, open the dashboard. Dashboard is an addon for kubernetes. docker build -t demo . Step 4/5 : COPY ./build/libs/demo-0.0.1-SNAPSHOT.jar . Minikube has a set of built in addons that can be used enabled, disabled, and opened inside of the local k8s environment. Below is a sample deployment config. Here I defined the service and deployment resource objects. This is the definition of a Kubernetes Deployment named demo-microservice. The replicas element defines the target number of Pods. Kubernetes performs automated binpacking and self-healing of the system to comply with the deployment specifications while achieving optimal utilization of compute resources. A Pod can be composed of multiple containers. In this scenario, I included one container: one for demo microservice image. If using private docker registry you need to set an entry under the imagePullSecrets which is used to authenticate to the docker Registry. For a detailed explanation of Kubernetes resources and concepts refer to the official documentation. Kubernetes will create one pod with one container inside. Now that the container is running in the pod, we can verify the health of the microservice. The pod is exposed through a service. Now that we are happy with the deployment, we are going to add an additional feature. The livenessProbe field specifies that the kubelet should perform a liveness probe every 3 seconds for demo. The initialDelaySeconds field tells the kubelet that it should wait 30 seconds before performing the first probe. To perform a probe, the kubelet sends an HTTP GET request to the server that is running in the Container and listening on port 8081. If the handler for the server’s /health path returns a success code, the kubelet considers the Container to be alive and healthy. If the handler returns a failure code, the kubelet kills the Container and restarts it. Readiness and liveness probes can be used in parallel for the same container. Using both can ensure that traffic does not reach a container that is not ready for it, and that containers are restarted when they fail. To verify these changes, spring boot actuator has a production ready endpoint called trace. Displays trace information (by default the last 100 HTTP requests). The actuator endpoints provide a wealth of information for your microservice. Make sure you become accustomed to them. A working example of using spring boot, docker and kubernetes.